We face Albion Rivers on Tuesday night at Forthbank in a rearranged fixture. Important game for the Binos need to get the win and close the gap between ourselves and Annan in the quest for a playoff spot. Don’t expect we will win by the same margin as last time we played the Rovers and would be quite happy to win by a couple of goals but win we must do. Expect us to be along the usual lines with possibly Peaso coming back into the squad for this game. Prediction Binos 3 Albion Rovers 0. Would be absolutely like us to lose this game. Although I reckon we probably won't. A win here and we are 1 point off the play offs, which at the start of the season seemed so unlikely to happen. God bless oor Kev. Surprised to hear that. Perhaps it suggests how difficult it is for boards to select managers and managers to find players. re match, no concerns for Stirling squad. Why was Peaso missing on Saturday and will he be playing or in the squad tomorrow? Had a knock on Saturday, don’t know if he is fit for Tuesday night. If he's got a bit of a knock I'd probably rest him tonight and get him back into the team on Saturday. Losing this is unthinkable but if we’re not at our best and AR frustrate us the points could be shared. At the start of the season you had 0 points, therefore the same chance of the playoffs as anyone. Losing this is unthinkable but if we’re not at our best and AR frustrate us the points could be shared win. . Lets face it if we lose to AR at home tonight we don't deserve to have a chance of getting to the playoffs, this should be a home win. Anything less than 3 points would be unthinkable. If we cant beat the team at the bottom of this League. it does not bear thinking about. Sure they will come and try to keep it tight and hit us on the breakaway but we should have more than enough to beat them. We should beat them, SHOULD. 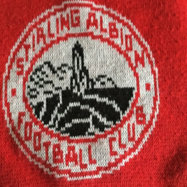 But this is Stirling Albion we're talking about, nothing ever seems to be simple. 1-0 win, people probably expected us to win by more but who cares? 3 points is 3 points and we are now a point away from the Play Offs, BRING IT ON!!!! Not the best game of football I've ever seen but a welcome 3 points. Rovers' number 10 missed an absolute sitter shortly before we scored. One of these misses where the entire away support is standing up with their heads in their hands in sheer disbelief. I thought AR were well organised but desperately missing any sort of cutting edge. We struggled to create much, the pitch doesn't look great. We may sneak into the playoffs but I'm not convinced we're better than Annan. Time will tell. A very, very ugly win but what a crucial win. 1 point off Annan now and on red hot form, things looking very good. Did not look like scoring till Mackin came on, very lucky so have the big guy and would be a miracle to keep him. Echo previous posters re the game tonight it was a struggle but thank f**k for Dylan Mackin who got the goal to get us the 3 points. Only 1 point behind Annan now with the same number of games played. Rovers robustly defended and they should have scored before we did but fortunately for us the Rovers player manged to balloon it over the bar from about 4 feet out. Still its 3 more points in the quest for the playoffs and onwards to Elgin on Saturday for hopefully another 3 points. I’ve not managed to make a home game since December but I’m a big fan of Mackin, he offers so much inside and outside of the box and is a battering ram figure head of the team. Yip, I’ll be surprised if we can keep a hold of him, but IF, and it’s still a big IF, we can bag promotion then surely would put us in a big position to do just that. Let’s not get ahead of ourselves here. We’ve narrowed the gap to the playoff positions to one point over the last 10 games. Not sure we are currently in good enough shape to win the playoffs although if we further improve in the coming months then we just might be. If we get into fourth position then we become the target for the teams below us so that will be a different pressure. Annan might spark off from our rise up the table in the way that our playoff push was sparked by a Berwick push in 2013. I didn't make the game last night but sounds as if we were set up not to lose. Bino fans- you have played both Berwick and Rovers consecutively ,how do both teams fair? Personally I think Rovers are gone. It’s only my 2 pence worth but I suspect you might be right, not because Berwick are any great shakes, they certainly didn’t look it on Saturday, but I do feel the damage has already been done to Albion Rovers. It’s a big ask for you to pick up 2 wins and a draw without Berwick getting any points, even more so when you’ve only had 1 win this far. I think the only hope Albion have is to keep battling away and hopefully at least 1 win puts the pressure on Berwick and they start to crumble, but you are starting to run out of games for this to happen. With 13 games left, you would assume that Berwick will pick up a few points somewhere along the line (as you probably will) but as I have said, having seen you both over the last few weeks, I think the damage has already been done sadly. Took the game in last night. Very, very low on quality but two sides both went for it. Imagine several players woke up sore this morning. Think Binos *just* about deserved it but I'd imagine it was far from their best performance in recent weeks. Outstanding form since Rutkiewicz took over though; 2 defeats in 14? Feel bad for Rovers. They worked so hard and then missed their big chance. Losing games like that do make you think they'll probably be finishing 10th. Have no idea how they'd cope in play-off but must be a nervy time for the club.